James Van Der Zee, a celebrated African American photographer whose studio was at the crossroads of the Harlem Renaissance, depicted the lives of black New Yorkers for decades. At the age of 14, he received his first camera and took hundreds of photographs of his family and the town of Lenox. In 1916, he moved to Harlem just as large numbers of black migrants and immigrants were arriving there. He set up his first portrait studio in his sister’s music conservatory and two years later, with his second wife, Gaynella Greenlee, established the Guarantee Photo Studio in Harlem. A new era was beginning in Harlem, a time when jazz, poetry, art, and literature all flourished. Capturing the glamour as well as everyday life, Van Der Zee became known as the eye of the Harlem Renaissance and the most successful photographer in Harlem. Early 20th century entertainer and dancer Bill “Bojangles” Robinson and renowned poet Countee Cullen were among his more prominent subjects. In 1969, the art world finally took notice when Van Der Zee’s work formed the centerpiece of the “Harlem on My Mind” exhibition at the Metropolitan Museum of Art. Although the exhibition was controversial and its many shortcomings caused anger in the black community, it did have a powerful effect on his career. Many in turn promoted his work in exhibitions around the nation. He and his images were also the subject of numerous books and documentaries. In the few years before his death, encouraged by his third wife, Donna Van Der Zee, whom he married in 1978 and who manages his estate, Van Der Zee came out of retirement to photograph luminaries such as Jean-Michel Basquiat, Miles Davis, and Muhammad Ali. Forty of his influential portraits are now on view at Howard Greenberg Gallery in New York from March 7- April 27, 2019. Spanning the 1920s through the 1950s, “James Van Der Zee: Studio” marks the photographer’s first exhibition in New York in over 15 years, providing a window into his legendary studio and the vast archive he created of Harlem’s cultural history. Unique among portrait photographers, Van Der Zee used painted backdrops and luxurious props, creating elaborate tableaux for his subjects, and bathing them in flattering lighting. After developing his photographs, he would at times take out his paintbrushes, carefully hand coloring his images. 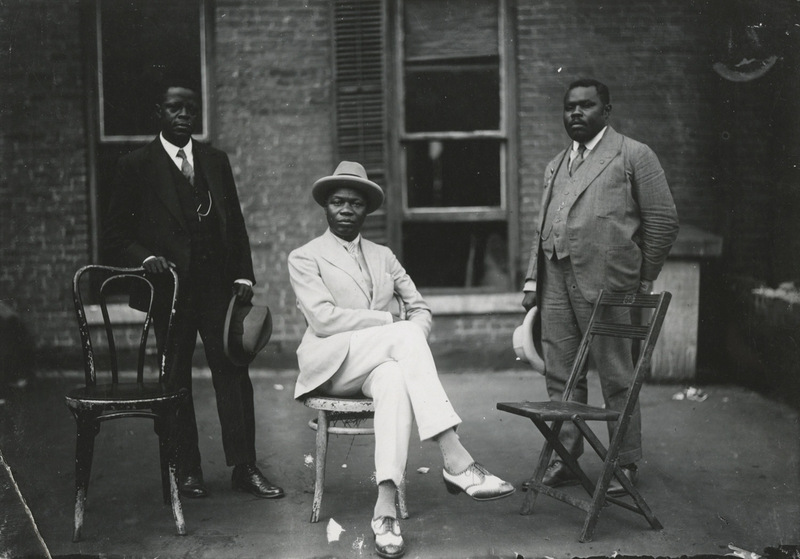 Finding and portraying the elegance and refinement of his subjects was his mission be it Marcus Garvey, the noted civil rights activist and politician, or multiple generations celebrating a family event. While known predominantly for his portraits, Van Der Zee also chronicled the streets around him. The exhibition will include his photographs showing Harlem storefronts, parades, and church groups, providing a glimpse of the era’s quotidian elements of life. Together with his portraits, they give viewers the most complete picture available of lives lived in Harlem for over a half a century. James Van Der Zee’s legacy has inspired numerous contemporary artists among them Lorna Simpson, who referenced Van Der Zee’s props in her recent photography; Dawoud Bey, who attended the 1969 Metropolitan Museum exhibition as a 16-year-old and was deeply affected; and Barry Jenkins, the director of the 2019 Oscar-nominated film “If Beale Street Could Talk”.